Let’s face it, buying a new vehicle is a serious financial decision. For most people buying a vehicle also represents the first major purchase transaction they will be involved with. With prices of new cars, trucks and SUVs being more than the yearly salary of many purchasers, Leasing A Vehicle instead makes a lot more sense. Consider this: The second you drive your new car, truck or SUV off the dealership lot, it will depreciate in value by as much as 11 percent. That 11 percent could equate to a loss in value of $3,300 on a $30,000 car. 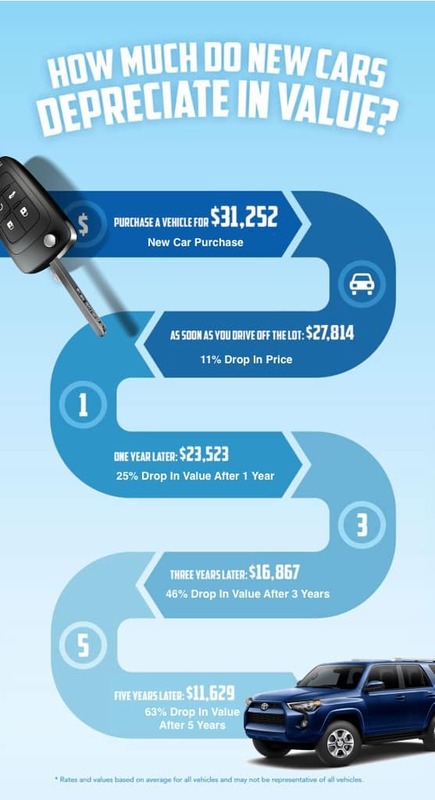 A year later that loss could be compounded by the fact that a typical vehicle’s value drops by as much as 25% in the first year and as much as 46% after 3 years. There are many factors that can go into reasons to lease a car over buying one and what makes the most financial sense. Here are some of the major topics to cover when deciding to lease or buy. Auto leases almost always have lower monthly payments than if the vehicle were financed through a purchased sale. Leases are designed to recap the depreciation of a vehicle + misc expenses that may occur during the lease rather than the whole vehicle cost. Let’s say you purchase a $30,000 vehicle with a 5-year loan at 3%. The monthly payment is going to be $539.06. This assumes no down payment was made and no additional costs were added. Now let’s say you leased that same $30,000 vehicle for 5 years. In this scenario the $30,000 car might have a calculated residual value of 45% after 5 years. In other words the vehicle will be worth 55% less or $13,500 at the end of the lease. The amount lost due to depreciation would be $16,500 ($30,000 – 13,500) or 55% of it’s original value. The car dealership would Divide $13,500 by 60 months and you would get a monthly lease payment of $225. As you can see the lease’s monthly payments are much lower than it would be to purchase the vehicle out right. The downside of course is at the end of 5 years, with the lease you don’t have the vehicle any more since it now has to be given back to the dealership. If you plan on keeping the vehicle you drive for a long time, it is usually better to buy than to lease. The longer you own the vehicle, in most cases the more you can save by buying. In most vehicle transactions the down payment to purchase a vehicle is going to be more than the down payment required to lease a vehicle. In some cases, dealerships will wave the lease down payment all together. Purchase fees such as taxes should also be lower with a lease simply because the tax is calculated ONLY on the monthly payments and not the total cost of the car. Note: Some States may differ when calculating car purchase fees and taxes. Most vehicle lease agreements come with specific yearly mileage requirements and going over them will trigger lease mileage penalties (Typically $.10 to $.20 per mile). It’s very important that when deciding to lease a vehicle, you have a good handle on how many miles you plan on driving each year. Typical leases will allow you to drive somewhere between 12,000-15,000 miles per year. As long as your mileage stays within the constraints of the lease, you are good to go, with no extra penalties. While being penalized for above-average mileage on leases sounds scary, remember that if you own a car and put excessive miles on it and then try to sell it, it will be worth less. So in the end putting excess mileage on any vehicle comes with penalties. Ultimately try as best you can to say within the average yearly mileage parameters of the vehicle and then you shouldn’t have to worry about penalties. The downside of course is if you have a life changing event, usually work related, that requires you to travel more on the road, you certainly could bump up against your lease’s mileage cap. In those situations you may consider terminating your lease IF the excess mileage fees are going to cost more than the termination fees. Something to consider. When renting a home or apparent, the landlord usually requires an additional months rent for misc damage that may occur during renting. Auto leases have similar clauses that kick in if the leased vehicle isn’t returned in pristine condition. If the vehicle has noticeable damage or scratches, you will often be required to pay additional fees at the end of the lease. When signing an auto lease, read all the fine print, especially pertaining to wear and tear fees. An example might be wear and tear fees = 3 months of the lease. At the end of the lease if the monthly payments were ($225). An amount of $675 would be due for wear and tear. For many businesses it might be advantageous to lease rather than to buy. Leasing allows you deduct a portion of the car’s depreciation and financing costs on your taxes. Note: Depending on your state you may need to talk to your tax advisor and/or view the latest changes to the tax system. When leasing a vehicle you are locked into a leasing contract and if you decide you don’t like the vehicle or want something else to drive, you could be facing significant charges (up to six months of penalty payments) to break the lease. If you plan on keeping a vehicle for an extended period of time, say 5 to 10 years, it might make sense to buy a vehicle rather than to lease it. Over the long hall buying becomes a cheaper option vs leasing. Certified Pre-Owned – What Does It Mean?